We’ve been banging on about Bruce Springsteen & The E Street Band coming to Liverpool (they never have) since we started. It seems strange that the place dubbed music’s “mecca” by Springsteen, in his recent autobiography, has never heard him live. For now, though, we’ve got a visit to look forward to from the world’s first and only all-female E Street covers group, The She Street Band. By Alan O’Hare. 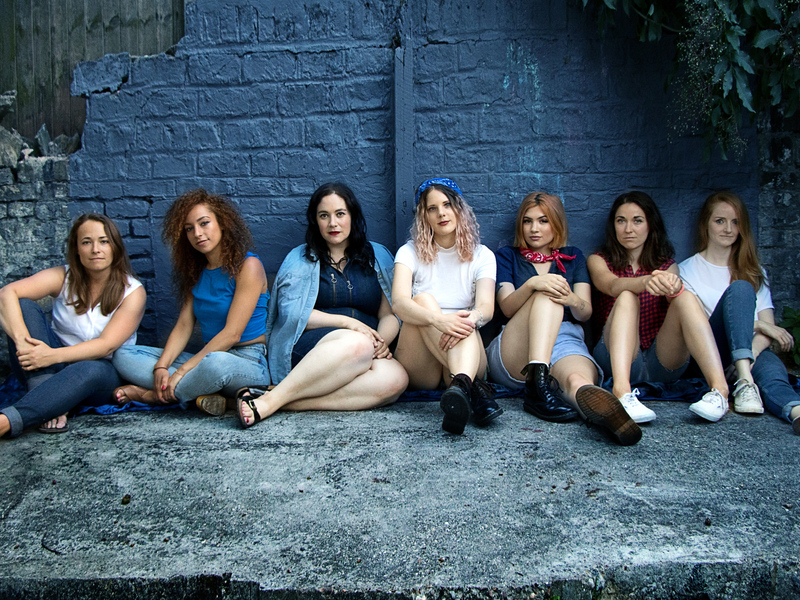 The world’s first and only all-female Springsteen covers act, The She Street Band have blazed a trail. They’ve sold-out shows in London, been booked to play the uber-hip Latitude Festival and are about to head out on a UK tour to top off a supreme first year at the races. “One guy said that he’d seen Bruce one hundred and eight times and that our show felt like one hundred and nine,” reveals Clare McGrath, who plays glockenspiel in the band. “That was crazy to hear!” Springsteen fans are like that. Notorious for their devotion to ‘The Boss’, they’re a tough crowd. But The She Street Band have had no problems winning them over. Maybe with the band enjoying some solo time (read our interviews/reviews with Nils Lofgren, Garry Tallent and Stevie Van Zandt) as the main man owns Broadway, fans were starved for some E Street-style rock ‘n’ soul? “The reaction from fans completely knocked us off our feet from the start,” says McGrath. “We didn’t expect what we got… the audiences have been amazing, full of energy and going crazy singing along! Bruce fans know their lyrics, that’s for sure!” The She Street Band bring the change uptown to Seel Street later this year, so I had a chat with them about it all. How did you pull the right band together? Orsborn: I was lucky in that I had some really talented friends already that I could call up and who thankfully were into it. A few of the roles were a bit harder to find, though… like saxophone and drums. I bet you had to do a lot of research? Orsborn: I actually watched through nine hundred ‘Sofar Sounds’ videos! I stalked people online and even accosted a female drummer at a ceilidh dance I attended to get the right band together! How did your first rehearsals go? McGrath: Really fun! I guess to start we were figuring out our own sound. We knew we weren’t setting out to sound exactly like Bruce… let’s face it: that was never going to happen! But we played around with different arrangements, sounds and had fun figuring out our own style as a band. As fans of his, do you think you’ve found the nuances? McGrath: Well, all of the girls in the band can sing so we pull out and highlight a lot of the harmonies in the songs. Figuring out how the hell he manages to fit so many words into one phrase has helped, too! Bruce is known as a very ‘male’ performer and writer, but we know that’s not true. The truth exists between the binary with Springsteen doesn’t it? McGrath: A lot of people associate that masculine image and sound with Bruce, but when you actually look a little closer you can see he’s a real storyteller. His songs talk about what it’s like to grow up, live, fall in love, get hurt… topics that everyone can relate to. We like to think that having his words sung by an all-female band puts a different perspective on them and really brings out another side of his music. Has the man himself or any of his E Street Band heard about it? Orsborn: Bruce’s bass player, Garry Tallent, has been amazing. His daughter Olivia attended a gig in London and Garry now sports our merch’ around Nashville! Amy Lofgren, the lovely wife of Nils Lofgren, has also been awesome tweeting her support and kind words to us. Bruce has to have heard about you… any word? Orsborn: Not yet, but we’re hoping! Me, too! I’m trying my best to get them to Liverpool! You guys are going to be the E Street pioneers, though… excited? McGrath: Very! We are so looking forward to hitting Liverpool… some of the gals are huge Beatles fans, so we’ll hopefully get some time to take in the sights. What songs can fans expect to hear? Orsborn: We play a lot of the hits: ‘Born To Run’, ‘Dancing in the Dark’ and ‘Thunder Road’, but we also try and throw in some surprising ones. In the past, songs like ‘Stolen Car’ or ‘I’ll Work For Your Love’ have kept the set fresh. McGrath: Thanks! We’re so looking forward to spending time with each other and going from city to city spreading the Bruce love!